A vacation request form is meant to submit a request for a vacation to the authority who would be approving the leave. It could be a staff asking for a time off from his company manager or a student requesting his university for a vacation. Such forms extend a professional tone to the leave request and serves as a written official proof that the Request Forms is being made and what has been done with the request. 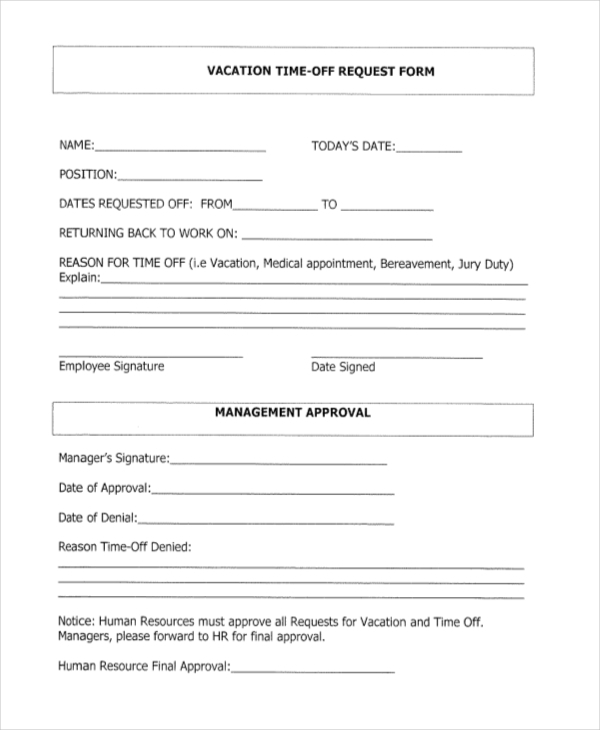 This is a simple and smart vacation request form you have which would be of great help for your HR department. It begins with basic information on the employee requesting the leave, the task he is assigned to, start and end date of leave, present vacation leave balance, his date of return to work etc. This vacation time off request form is to be filled by both the employee and the manager entrusted with the power to authorize the leave. It begins with the name and the position held by the staff in the office, the duration of his leave, the date when is resuming work as well as the main purpose behind his request for time-off. You have a minimalist vacation pay or donation request form which contains only the most relevant sections needed for such a form without the additional extravaganzas. It contains sections name of the employee, his or her vacation pay request date, pay period ending date and the amount requested. It is to be approved by the payroll department. You have two vacation time request forms in one sample. 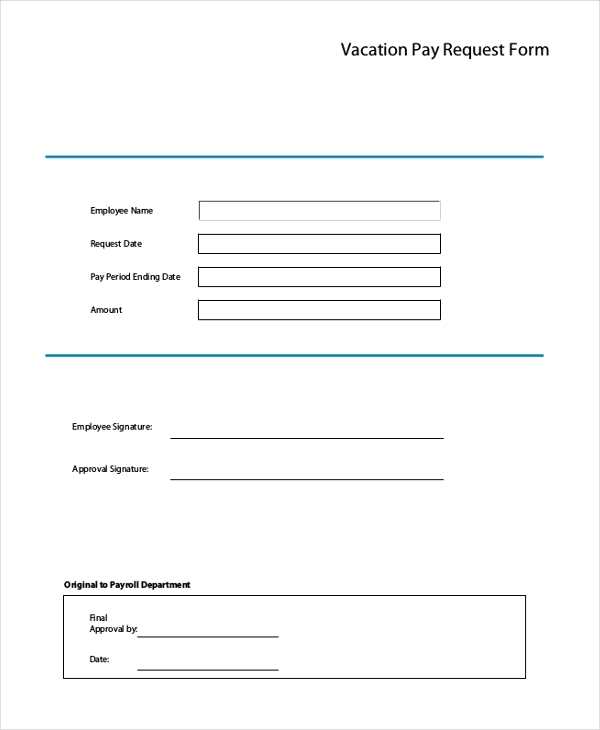 These forms contain all the required sections like date of the request, employee’s name, the time off requested, the explanation for the request made, the vacation pay amount and the payment date. Below there is another section for the manager, who is responsible for offering his approval for the request. You have professionally drafted vacation request form here which must be filled out both by the staff and the administrator. The form commences with the name of the employee, his SSN and employment date. Then, it contains sections, days requested for vacation, day off took by the employee earlier and comp. days. Below there is a space for the administrator’s comments. 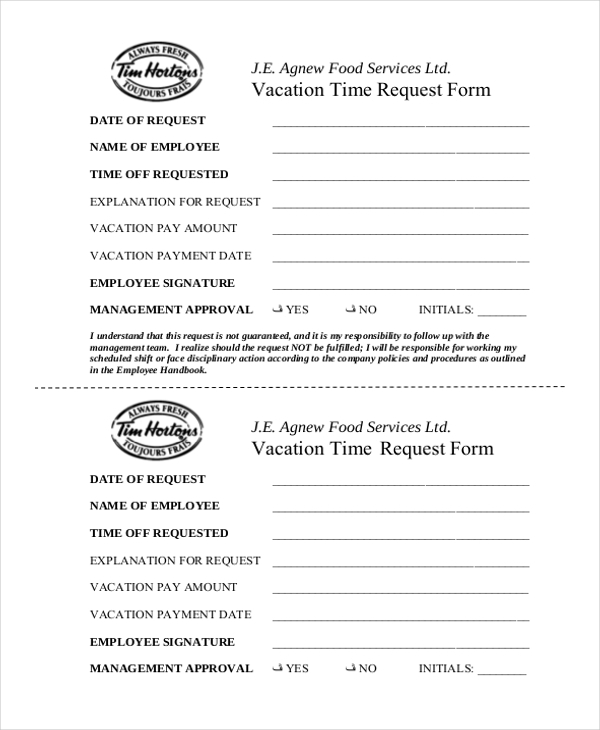 You have a neat vacation request form which contains all the important points regarding the vacation request by the employee. The form is packed with sections, the name of the employee, his designation and department, the number of vacation days earned, the number of vacation days requested and for which dates etc. This school vacation request form would be helpful for the childcare center providers for the parents who is in need of childcare services from them during the school vacation of their kids. The form supports up to 3 children and contains sections on the name of the parent, children, care provider, care dates, start time as well as the end time. This annual vacation requested form would be handy for academic institutions and is to be filled by the students requesting for leave from the organization. The form starts with instructions to be followed by a student regarding his request for leave followed by his declaration on the plea for vacation and with information on the duration requested for vacation. You have a smart and basic employee vacation request form here which begins with information on the name of the employee, the department at which he works in the company followed by data on the dates of vacation, total hours requested and the date on which he would resume work. What is The Purpose of Vacation Request Form? As the name suggests, the main purpose of vacation request form is to send a plea for vacation. In most of the cases, these forms are to be filled by the employees willing to take a leave from his company and the form is sent for approval to the company manager. You might request the leave orally but when you submit the whole thing in written, it gets the needed formal touch. Another big purpose of these forms is to serve as an official proof of the leave requested and authorized. Your company will have complete data on the date when you will return to work. You may also see Donation Request Forms. Who Needs Vacation Request Form? A vacation request form is to be required by any company, irrespective of the industry. Whether you run a restaurant or an IT firm, you will have your employees asking for leave and it is in such situations when you would need to forward this form to your staff. More precisely, it’s your HR department who would need the form as the vacation request has to be authorized by the HR manager only. Added to offices, the academic institutions would benefit greatly from the vacation request form. It would be used when the students wish to request for vacation in a formal manner. What is Covered by a Vacation Request Form? 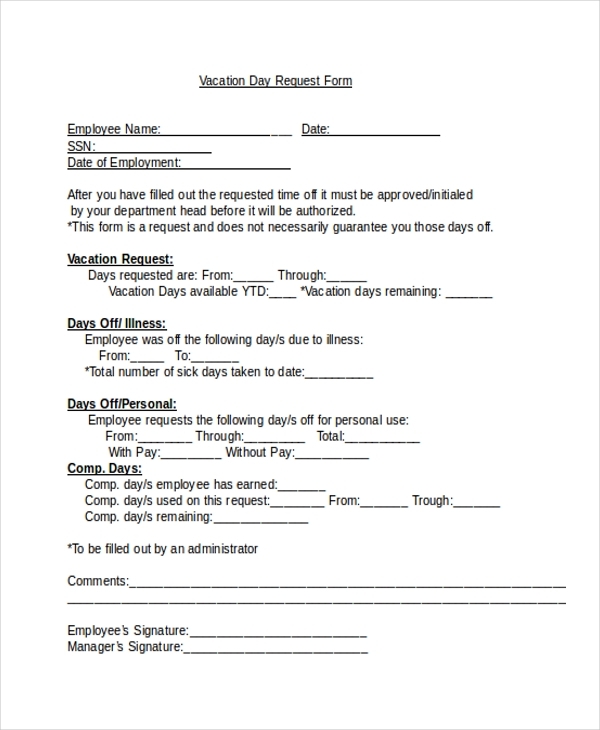 A vacation request form primarily forwards the plea of vacation to a higher authority, mostly on behalf of an employee. Naturally, it comes with sections relevant to the leave request such as the dates requested for the leave, the particular date on which the employee would be returning to work and so on. Some of the forms also ask the employee to mention the reason for taking the leave and the leaves earned by him as well as the leave balance. Besides, such forms come up with space for signatures from both the employee and the manager entrusted with the power to authorize the request. You can also see Service Request Forms. If you are in need of guidance on how to frame a vacation request form, the samples mentioned above would be of amazing help for you. These are standard leave request forms designed by professionals and can be used both by academic institutions and offices. They are easy to customize with your data.